Characterizations of the Tax Cuts and Jobs Act have followed agendas  its opponents maintaining it is a bill for the wealthy, and its supporters arguing that the bill fairly satisfies all economic levels. The single taxpayer in 2018, using the standard deduction, had a $1950 advantage in taxable income compared to the single 2107 taxpayer. Because the tax rates were also lowered in 2018, a single taxpayer of equivalent gross income gained another advantage and paid less tax than in 2017. By absolute figures, the higher the earnings, the greater is the benefit. However, a more accepted manner for examining the figures is by proportion. By this criteria, the lower waged earners received the greatest benefit -- 21% for low wage earners, 18% for high wage earnesr, and 9.3% for ultra-high wage earners. The results for single taxpayers, using an itemized deduction of $16,000 deduction, are shown on the right of the table. In this case, the 2017 wage earner had an advantage. In addition to the $16,000 itemized deduction, the 2017 wage earner received a single exemption of $4050 applied to the deductions. The lower tax rates in 2018 offset this advantage, but insufficiently; none of the single taxpayers received much benefit, and the lowest wage earners actually paid slightly more taxes. 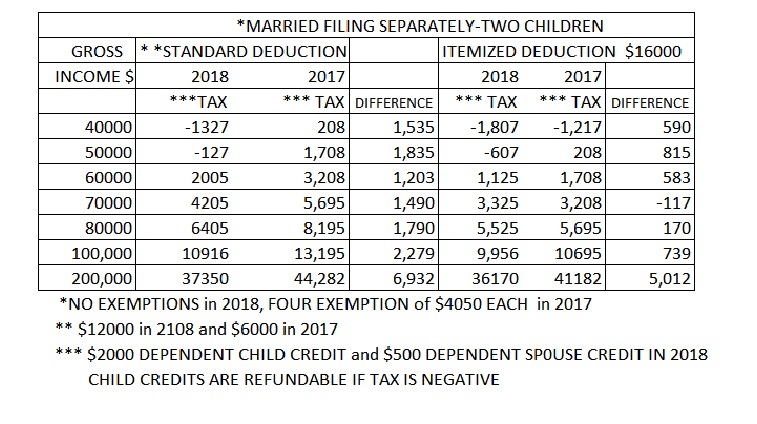 The higher tax credits in 2018 enabled this type of married taxpayers ($4500 tax credits) to reduce their taxes in 2018. Note that the difference in taxes between the 2018 single taxpayer using the standard deduction and the married taxpayer using the standard deduction is exactly $4500. In this scenario, the absolute tax gain was almost equal between all wage earners, except for the ultra-high wage earners. Proportionately, the lower wage earners received the most benefits. As an example, if N=2, K= 80 (expressed in 000), and I = 40 (expressed in 000), then TC = 4 or $4000. Although the Tax Cuts and Jobs Act managed to save 2018 wage earners something in their taxes, the savings begs another question, Were the benefits sufficient to warrant the Tax act?" Entering into the discussion is that the reduced taxes increased the federal deficit. Regarding the entire situation from a total perspective, we have the increased deficit essentially financing the tax cuts -- wage earners received a temporary loan from the government, which should be repaid one day by increased taxes. Should be, but not definitely  the deficit monotonically increases with no regard of ever reducing it. The tax cuts could have been used to re-distribute the wealth -- heavy tax cuts for low wage earners and no tax cuts for ultra-high wage earners. Why give those who earn $200,000 another $5000 and low wage earners only another $1500? Shouldnt it be the other way? Better yet, why not make tax cuts behave budget neutral -- have low wage earners receive sizable tax cuts and ultra-high wage earners pay more taxes to compensate for the revenue lost to the government planners.. Going further, why has the administration bothered to spend huge dollars for preparing, legislating, and managing new income tax policies that gave $6000 to people who already had after tax income of $160,000, and served to increase the federal deficit and support their largesse? Why did it not maintain the same tax legislation and use the costs incurred for the new tax legislation together with the monetary benefits that occurred with the new legislation and use the total revenue to assist the least advantaged citizens of the American economy? (1) The Tax Cuts and Jobs Act favored those using the standard deduction. (3) The fact that the Tax Cuts and Jobs Act was not budget neutral and increased the deficit, its effectiveness is definitely judgmental.